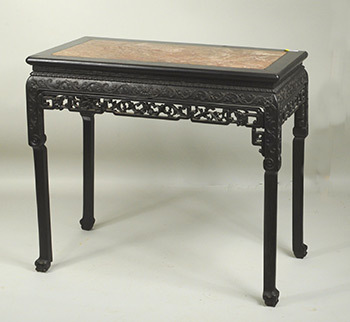 Woodbury, CT – On Wednesday, February 22nd at 11am, Schwenke Auctioneers offered 648 lots of estate material featuring the lifetime collection of Dr. & Mrs. Ion Petrea and including a large collection of Asian decorative art from several other estates and consignors. The sale was held live in the firms auction hall at 710 Main Street South in Woodbury, and was broadcast on three internet platforms. 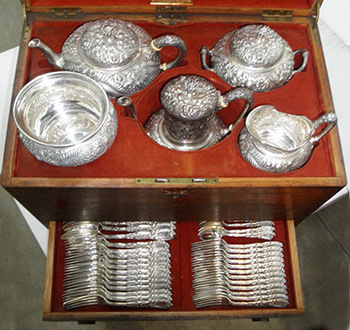 The top lot of the sale at $10,900 to a bidder in the room was a Tiffany & Co. cased sterling silver five piece tea and coffee service, monogrammed, in a floral repousse pattern together with a partial Tiffany & Co. flatware service, monogrammed, in the "Chrysanthemum" pattern. The tea service comprised a coffee pot, teapot, covered sugar, creamer, and waste bowl. Tea set weight was 90.92 ozt. The flatware comprised twelve dinner forks, twelve luncheon forks, twelve tablespoons, twelve teaspoons. Flatware weight was 135.45 ozt and the total silver weight 226.37 ozt. All items were contained within a Tiffany & Co. oak presentation case with key, mounted with a brass plaque reading: "C. Eugene Gunther from his Uncle John Seymour July 5, 1917". Provenance is from Bernard Baruch, given to John Seymour, President of NY Stock Exchange upon his retirement. John Seymour gifted silver in 1917 to nephew C. Eugene Gunther, who willed silver to daughter Juanita Gunther. Juanita Gunther willed silver to her cousin Shirley Gunther Smith in 1977. Several Asian lots performed well, including the second high selling lot which was a fine Chinese porcelain famille rose bottle vase of inverted pear form with flaring neck, decorated with blossoms and geometric banding, the base with Daoguang seal mark, 13" high, 7" wide. 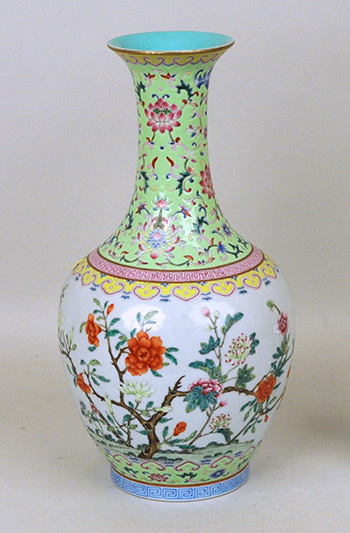 The vase sold for $6,900 to an internet bidder. 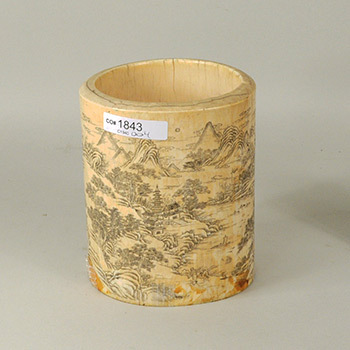 Other Asian lots of note included a group of Chinese snuff bottles in various forms and mediums, twelve pieces, together with four hardstone and jade carvings, which fetched $2000 from another internet bidder in Canada. A Chinese porcelain wucai dragon bowl together with a smaller bowl having bird and blossoms decoration, both with six character Guangxu marks, sold for $2,500 to an internet bidder in China. A large framed Tibetan thangka, pigments on fabric, sold for $1,750 also to the internet. 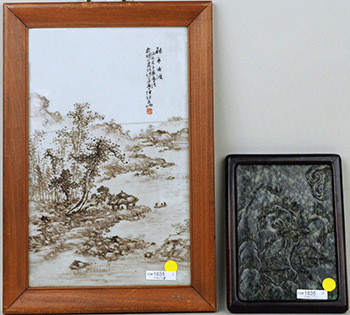 A Chinese porcelain panel with landscape scene and calligraphy, together with a landscape carved spinach jade plaque in a hardwood frame, largest sight size: 15" high, 9 1/2" wide, hammered to an internet bidder at $6,800; and a Chinese ivory brush pot with elaborate landscape scene, Qianlong mark and old collection label to the base, 5 1/2" high, 4 1/2" wide, ex collection Dale Carnegie, purchased 1939, went out to a phone bidder at $4,250; a Chinese carved hardwood side table with rose marble top, 32 1/2" high, 35 3/4" wide, 18" deep, hammered to an internet bidder at $2,000; and a Tibetan thangka of Maitreya, pigments on fabric, 49 1/2" high, 34" wide, sold at $2,375 also to the internet. The collection of Dr. & Mrs. Ion Petrea included numerous fine Russian and Romanian icons. The items were received well by the audience and notable results include a Russian icon of the nativity of St. John the Baptist, showing the birth to Elizabeth and attendants, and the washing of St. John the Baptist with Zachariah seated upper right, tempera and gilt on panel, together with, but separated from its silver riza. The silver riza bearing marks for Moscow, dated 1870, and selling at $1,350 to the internet; a Russian icon of St. Nicholas with selected saints, full length image of St. Nicholas, the guardian angel and selected saints below a tablet with scenes of the prophet Elija in the wilderness, tempera and gilt on panel, also going out to an internet bidder at $1,600; a large and impressive Greek icon of Saints Constantine and Helen, the full length figures of Saint Constantine the Great and Saint Helen with the cross of Christ below an ascended Christ, the frame with Saint Nicholas, Saint Paul and others in niches. Tempera and gilt on panel. The icon was signed and inscribed lower left and right, bearing date 1886, and left the block at $2,700 to the internet; an icon depicting Saints Peter and Paul, pigments and gilt on panel, bringing $1,050 from an internet buyer; a large early Russian icon of Christ in Majesty, the figure of the ascended Christ seated on a celestial throne and encircled by angels, bordered by the lion, the calf, man and the eagle representing the four evangelists, tempera and gilt on panel, 21" high, 17" wide, which was claimed by a phone bidder at $2,300. An extensive assembled collection of Copeland Spode Italian wares, including twenty-seven dinner plates, twelve luncheon plates, twenty-two salad plates, four platters, five large bowls, seven small shallow bowls, twenty-one saucers, fifty-eight small plates in several sizes, fourteen shallow bowls in several sizes, twenty-seven tea and coffee cups, two small trays, one tureen, one gravy boat, one trivet, two teapots, coffee pot, milk jug, two creamers, etc, approximately 150 pieces, surprised above estimate and sold for $1,750 to an internet buyer. Also surprising above estimate was a group of five Globe-Wernicke oak bookcases including three size D 8 1/2 Grade 299, two D12 Grade 299, which sold to a phone bidder at $3,200. An interesting furniture lot from the Petrea collection was Arturo Toscanini's four carved mahogany hall chairs, each with flaring fluted back on square tapering legs, 36 1/2" high, 17 1/2" wide, 16 1/2" deep. The provenance of the chairs was purchase from the estate of Arturo Toscanini, purchased in 1978 by the consignors from Wanda Toscanini Horowitz, the wife of famed pianist Vladimir Horowitz. The sale also featured numerous early Caucasian and Persian carpets in many regional designs and weaves. Among the top selling lots were a fine Persian Heriz room size carpet, 20th century, 8' 11" long by 10' 4" wide, which sold to a bidder in the room at $3,000; and a palace size Sarouk rug measuring 25' 10" long by 12' 3" wide, which sold to an absentee house bidder at $1,800. The firm’s next scheduled gallery auction is 20th Century Decoration & Design Fine Estates Auction, being held on Wednesday, March 29th at 11:00 am. The catalog for the sale will be viewable at www.woodburyauction.com and will be broadcast on the internet. For information on the sale, or to discuss consignments, please call Schwenke Auctioneers at 203-266-0323.